I have been remiss in posting my Christmas Day photos, so here goes. The first one is actually from Christmas Eve, because really, is there a better day to read the Grinch? When you can get to the part about "Christmas is tomorrow, it's practically here" it really is! Growing up it was always my job to tire Dave out so he would sleep through the night. He never did. We'd often read stories together as part of the attempt and I thought of you little brother as I pulled this out that night. (And to this day, thanks to all the times we watched Muppets' Family Christmas every time I hear "Sleigh Ride" my brain still hears "there's a party at the house of Fozzie Bear. . . ") I never sleep that well the night before Christmas either. Too excited. I can't decide if I want to grow out of that someday or not. It's an easy walk to Gord & Shannon's but it's a fair distance if you're shoveling. I was so touched that the three of them would do this for us. What a great gift to start the day with. It did snow ALL night so it was a little hard to see where the shoveling had happened, but as I walked through the snow my heart was light with the thought of what they had done and that definitely made the snow far less of an impediment. This is my street Christmas morning. I don't know if I've ever been out walking on Christmas morning before but it was a beautiful way to start the day. It was quiet and peaceful and white and blanketed, as though all the trouble of the world had been muted for the morning. I know it was an illusion, but what a pretty deception. To give you an idea of how fast the snow was coming down. This picture was taken just outside my front door as I headed out. This is Gord & Shannon's where the main events took place. It looked beautiful walking up the drive that morning, fresh snow failing and the lights on the house and the lights from the tree shining through the window. The photo does it no justice at all, but I can still see it in my head, and trust me, it was lovely. 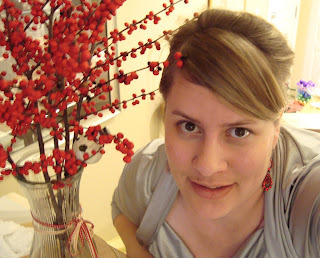 I was trying to also get my shiny new snowflake pendant in this shot. It didn't work at all, but it's a great shot of me & Coli. Coli got Lululemon pants for Christmas and they're great pants, but I think she needs to stop wearing them for at least at couple of years. She looks far too grown up in them. Surely she's not *really* turning 13 in a couple of days. That must be someone else. This is Sammy, Tracy & Hugo's youngest. And I know it's out of focus, but look at that face! Tell me you could let a little focus get in the way of sharing a smile like that. At this point in the day Sammy and Kendra were roaring at each other like lions using the stair railing in place of cages at the zoo. Hilarious. Tracy & Hugo braved the snow to come with Chrisaleen & Sammy and share Christmas. Yay for more faces! I remember when this little guy was born, seems like just yesterday. It was a lovely Christmas. Lots of cousins & nieces to talk to and play with. (I may have lost Scum but I did win Carcasonne). There was delicious food and always a conversation happening somewhere. The snow came down all day. The kids spent hours playing in it and the grown-ups spent hours not playing in it. It truly was a celebration. And best of all is knowing that there will always be a place for me at the table. Around here, that moon-on-the-snow looked something like this. Clearly we will be having a white Christmas this year. Maybe even the whit-est Christmas of all. Amanda and I were both quite shocked by the accumulation. The stockings were hung. . . but we had to take them down to fill them. Merry Christmas! May God bless us, every one. If you have little gifts that you don't want to get lost under the tree, try making these little boxes. They're very easy to make and just the right size to keep your treasures safe. The template is available on Esty.com from A Little Hut. Five dollars gets you all four designs and the PDF is emailed to you the same day so you can get started right away. Because the PDF is saved to your computer, there's no limit to how many boxes you can make. All you do is print the template directly on to your paper (I used regular construction paper) then follow the guidelines to fold and stick. I added a little glitter to mine because it's Christmas and everything that could sparkle should. If you haven't gone exploring on esty.com yet, I highly recommend it. It's billed as ebay for all things handmade and there are some beautiful, beautiful things on that site. Happy boxing! This was the card that Dave & Janie sent out in 2006. I couldn't blog it back then because not all of the cards had arrived yet and I didn't want to ruin anyone's surprise. I kept mine and have it on the desk by my laptop where I can enjoy it at eye level. It has stood the test of time and is still genius. On the front is lovely tree paper (it says 'Celebrate together' if you're having trouble reading that). And then when you open it up.. It's a custom pop-up card! How cool is that? There's Janie & Dave decorating the tree and as the card opens the garland stretches into place. I have a long and abiding love of pop-ups to begin with, but pop-ups that look like people you know? Very cool. I think Dave's hand with the star is brilliant, so Seuss-ian. I'm pretty sure he said that the plaid on his shirt was hand drawn line by line. But that's very Dave, when it's his art, he lives in the details. These are the guts of the card, all those working pieces. I wonder if I can video tape it so you get the full effect? A project for another evening. This is me with Angie & Kim, who sometimes go by their alter egos "Boo's parents". Boo, also known as their daughter Matia, is a bit of a legend. Kim suspects she has mad drumming skillz and while it's still a little early to tell, he's probably right. 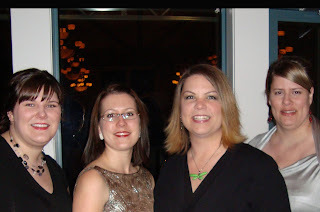 This is Nicole, Sarah, Lynnette and myself all spiffed up and party-ready. This is the group shot of our table. As I mentioned on Facebook, Kim said I could sit at the Asian table, being honorary Asian and all. Xie xie! [she-shay, which means 'thank you' for the uninitiated.] I just realized I could have worked one of my other Chinese phrases into the evening and missed my chance. A whole meal and I never once oh so causally mentioned "mung mung"? Maybe it's less cool if it's Taiwanese baby talk rather than Canto anyway. 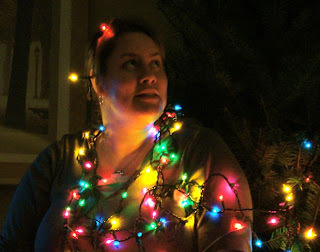 It's looking very Christmas-y around here (and not just when I'm playing with the lights). 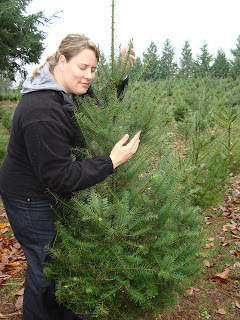 Last weekend we headed off to a local tree farm to find a tree. Space in our place is limited so we carefully measured what little room we have and headed off with tape measure and specs in hand. I learned quickly that I am terrible at judging sizes. We had agreed that a 3 foot tree was probably as big as we could go, but when we got to the farm the 3 foot trees were just so little. There were all little round balls with spindles on top. Barely trees at all. We trudged on in the rain, measuring a tree every row or two. I could feel my Christmas shrinking a little. And then, off to one side, I saw our tree. There he stood, a majestic 5 footer standing out in a crowd of rounded ankle-biters. If trees had to go to junior high, you know this is the one that would have been picked on. I thought he was beautiful. Kendra thought there was no way he was going to fit. We got out the tape measure and sure enough our shapely tree was only 2.5 feet across, on the high end of our specs to be sure, but slender enough to squeeze in. I looked longing over at it with the gaze 5 year olds reserve for new puppies and knew that Christmas would be safe after all. The tree farm man cut him down, we loaded him in the truck and brought him home. Sure he's a little taller than we agreed to, but I think he's perfect. (And no, I have no idea either how this tree acquired a gender, he just did.) With the tree in place, Christmas could truly begin. On Thursday night we headed back to Michael's for a cookie decorating class and learned a new technique that has been put to vigorous use this weekend, but that's another post. I really liked the way the colors came out on these. 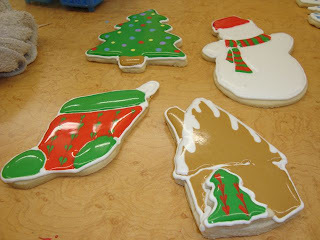 Working with Royal icing gives you a lot of wiggle room to move the icing around so all sorts of intricate patterns are possible. A good time was had by all. 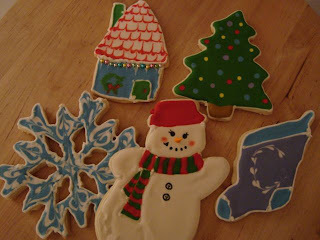 With the cookies decorated, it was time to head to Creative Nails to decorate myself a little. I stick to a classic French manicure most of the year, but Christmas calls for a little sparkle. 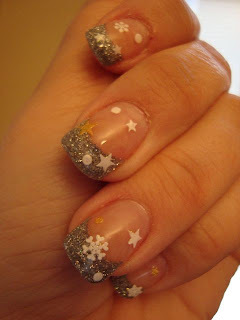 Besides, around here, fancy nails are a Christmas tradition. 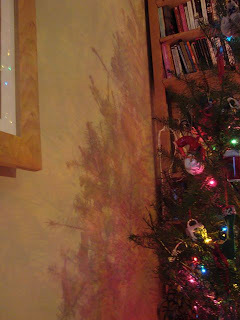 The tree is tucked in the corner this year and in the evening it throws these perfect shadows up against the wall. I have no idea how to photograph it properly, but you'll have to take my word for it, it's very pretty. On Friday I took the day off to do Christmas-y things and in the morning Shannon came over to make snowmen and snowflakes (of the indoor variety). 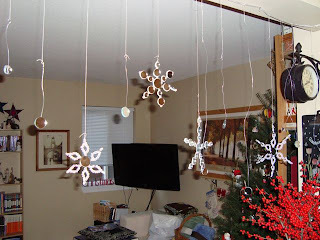 I finally got them all finished and strung up and I think they look rather festive. For some reason, they also make me think of IKEA although I'm really not sure why. They are very sparkly. I may do some more if I can find more of the little mirrors. The snowmen are still a work in progress. It's crazy to think when we wake up tomorrow Christmas will be just 10 days away. What a lovely time of year. It was time to get Christmas-y at the office and I decided to make a tree worthy of our team. Thus the nerd tree was born. I know, I know we prefer the term "Geek" but this just seems like a Nerd Tree to me. It is a badge I wear proudly. The tree has ornaments featuring some of our favorite apps. And RSS.... This was the only one that had to stay square. It just looked wrong in a circle. 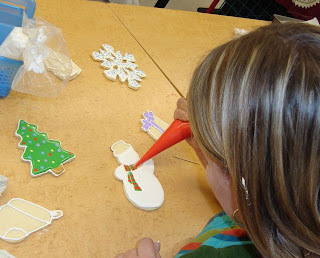 It was Kendra's idea to add the glitter on the edges of the ornaments. There are ornaments with the Java logo on them too but apparently I forgot to photograph them. Whoops. I really liked the way the Basecamp logo turned out. I never noticed how much it looks like a snow globe. If you're not familiar with Basecamp they are the brains behind Project Path, a task management system so brilliantly simple and intuitive that our artsy team of writers and editors has embraced it. I have to admit getting into any task system was a hard sell for me, but now that I've seen what it can do I can honestly say that this product keeps our team sane. In addition to the apps there are ornaments that celebrate two things that make everything we do possible. Apple (of course) and Starbucks. 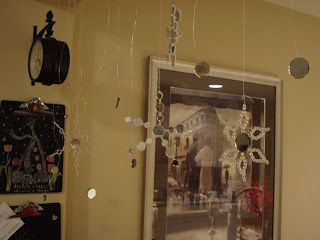 For the garland I made a paper chain cut from pieces of an old Wired magazine. Wired is the best nerd magazine out there, and they also use really nice inks in their printing process. I knew I'd be able to find some great colours on their pages. I think it turned out well. It was a hit at the office today. Have yourself a nerdy little Christmas! I know we will.